As my Back to Uni series continues, I thought it would be a good idea to address one of the biggest issues facing students, money. 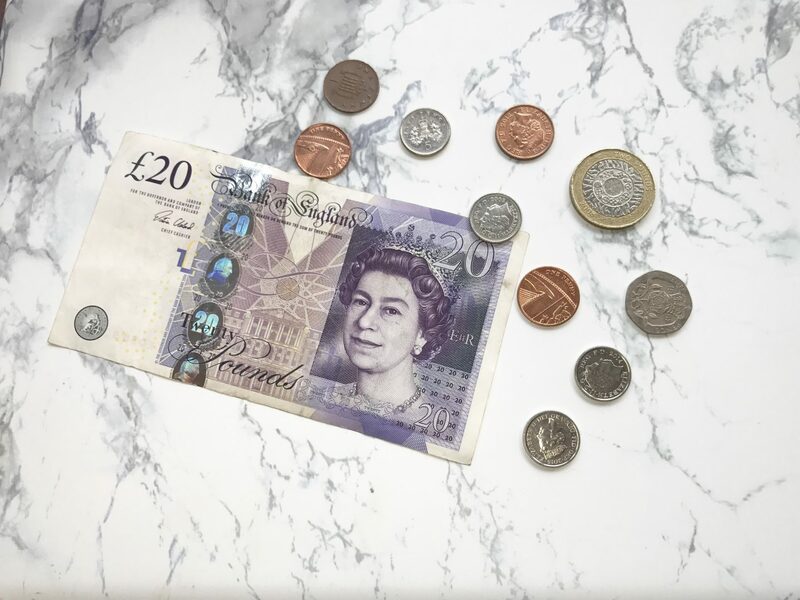 As the start of a new term brings a fresh student loan, students will fall into 2 categories, 1) they will have so much money they want to spend it all at once or 2) Their student loan doesn’t even cover their accommodation let alone living expenses. Lucky for me I fall into the latter category so I thought I would share with you some tips I have picked up in the last 2 years at Uni. Buy Food in Bulk and cook in bulk, for example make 1 big batch of Chilli, Spag Bol, curry or whatever and then reheat the leftovers the next day for dinner or freeze to defrost on demand. I do this all the time by taking the spare portion to work so I don’t have to buy my dinner whilst I’m there. Not only are you making multiple meals but buying larger quantities is usually cheaper- a prime example is pasta. Sticking with food, best before dates are questionable, unless it’s meat then don’t question it longer than a day or so. I’m talking peppers, onions, potatoes, bread- all these items can last a lot longer than the sell by dates let on. Remember they are self by dates not use by dates. 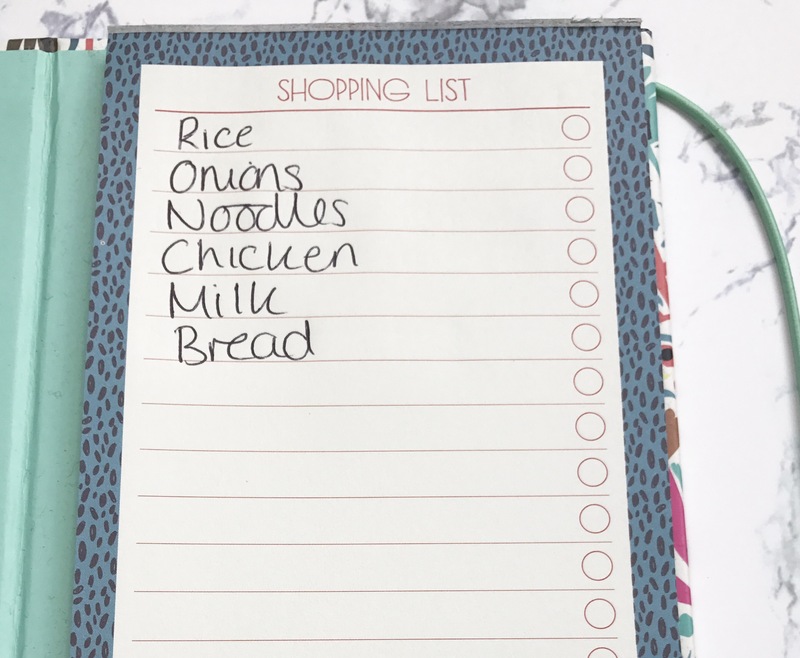 Final foodie tip- write a shopping list with at least a vague idea of what you will be eating for the week and having taken note of what you already have in the fridge and cupboard. When at the supermarket, stick to your list and don’t go when you’re hungry as you are more likely to be tempted by unhealthy snacks. Avoid big name brands, switch to the supermarkets own alternative for less money, 9 times out of 10 you can’t taste the difference. I like to go to Aldi and do a weekly shop instead of shopping everyday as and when, I’ve noticed when I shop daily at Tesco across the road I spend a lot more and get a lot less. Be sure to have loyalty cards and points cards for places you shop. 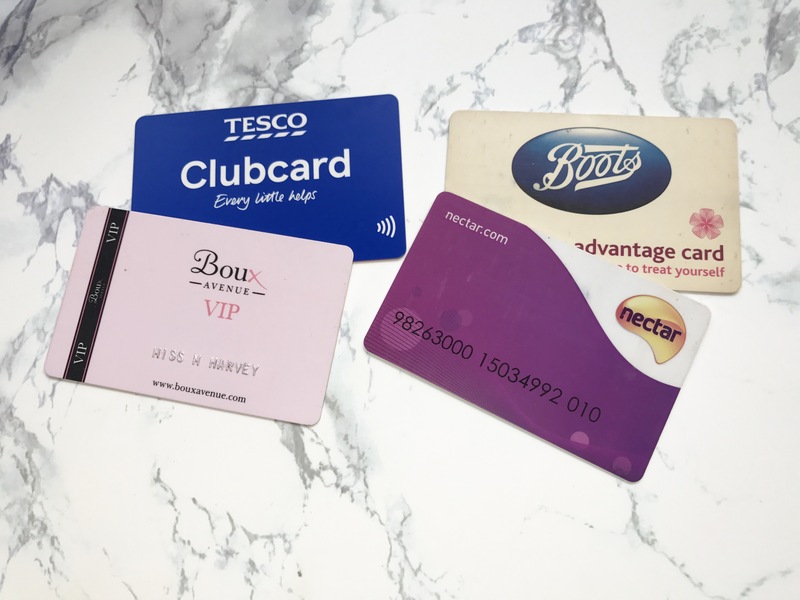 My favourites are Boots Advantage Card (very handy for grabbing a meal deal or toiletries or a last minute present), Tesco Clubcard and Sainbury’s Nectar Card and Boux Avenue VIP Card. If you don’t have a card then apply for one they are almost always free, country to what people seem to think they are not store credit cards and the shops are actually trying to give you money so just take it. Ask for Student Discount, you’d be surprised how many places accept student cards for minimum 10% knocked off your shop. Be sure to take advantage of Student Shopping events for additional discounts and freebies and don’t forget to think outside the box. River Island rarely offer student discount but ASOS, who do, stock River Island pieces so it’s worth checking on there first. Take advantage of good offers, if you see your favourite shower gel on offer at £1 not £2.50 grab a couple to last until the next time it’s on offer. Buy one get one free are great deals to stock up with. Use free memberships and trial periods, Amazon offers 6 months free Prime to Students to save on delivery costs and to get the best deals, just remember to cancel to avoid paying the yearly fee. Many students rely on trains to get them to and from home during the holidays or to visit friends at other universities, but did you know that the cheapest time to buy train tickets is exactly 12 weeks before the date of travel, so if you know you will be going home for your Mum’s birthday or Christmas, book your seat early to avoid extra charges. Shop around Student Bank Accounts, many banks offer incentives to make students choose them, for example when I came to Uni I chose Santander as they offered me a free 3 year railcard worth £70 which gets me a third off all my rail journeys. Other banks offer Coach Cards, the offers change but it’s worth looking into. Walk to and from Uni if you can, if the weather isn’t absolutely appalling try walking with friends to lectures to help keep you fit and save money on bus fares. Did you know McDonalds offer a free Burger or McFlurry when you buy any meal and have a student card? It’ a good way of getting a freebie for yourself or maybe you could pass it on to someone less fortunate and give a homeless person the burger to ensure they get a bit of hot food that day. Greggs have a rewards app so you can build up rewards when you spend. Similarly Benefit offer a rewards app for their brow services, every other time you have your brows done you get a reward such as a free Brow tint on your next visit, just because you’re at Uni doesn’t mean your brows can’t be fabulous. Visit Fresher’s fairs to get freebies and enough stationary to sink a ship, the goodies are usually random but often come in useful and are sometimes of the edible variety. Buy a Water Bottle and a Flask to take to Uni to save money on bottled water and hot drinks each day. Pre- Drink to save money in the club, I’m a big advocate of this because I hate being hungover and as I’m not the biggest drinker I don’t rely on too much alcohol to enjoy my night. I prefer to drink whilst at home but only have a couple of drinks, if any whilst out- saves money and saves you from a hangover. All these tips are things which might sound small on their own but combined can make a big difference to your budget. One point I have yet to make and is blatantly obvious is to get a job. I have worked the whole time I have been at Uni and it has ensured I’ve had disposable income to spend on things like my social life, clothes, makeup, going out for food. Having a job has meant I haven’t missed out on opportunities because I’m skint. Students who look for jobs immediately have a better chance of securing some part time retail or bar work as we enter into the bust Christmas shopping period. Not only that Uni’s often offer payment for students who help run open days for Accommodation and Courses, I literally can’t imagine what I would have done without my job so I would highly highly recommend it. So hopefully a few of these tips have been helpful for any Uni students out there, let me know in the comments if you think I’ve missed anything! These are such great tips! Totally agree with everything, especially about the bulk/cooking point! Its crazy how much you save when you cook at home instead of ordering in or eating out! Okay I have a confession to make: I have tried the batch cooking thing a few times and it hasn’t really worked for me. Mostly I don’t even know what to make in all honesty. Do you have like some go to recipes you use? Got to be done hahaha I love beans!